In our small town, there aren’t many choices for shower curtain shopping, which I like. But, I made my way into Dollar General one morning before school to check out the shower curtain stock. When I told Papa I was going to buy a shower curtain at Dollar General, he smiled and said, “Do they have those there?” “They should, they have some bathroom stuff.” I said. Walking into the store, I feel a bit defeated since I try to stay out of stores where most items are made in factories with low low wages and unsustainable materials. I just want a shower curtain, I think justifying the fact that I am in Dollar General. I look through the surprising wide variety of shower curtains and pick one. 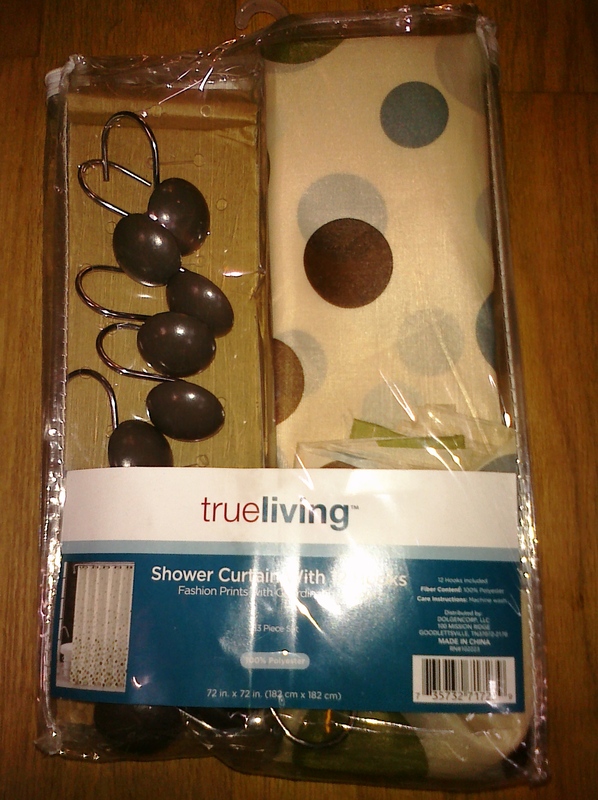 It has a print I can deal with and even some hooks (we already have hooks, but I like the pattern the best, so I pay the extra money for the hooks). There’s no way around it; I don’t need this stuff. I get home and hang up the curtain right away. It looks flimsy and plastic and lifeless. There is a stark contrast between our hand-built home and this shower curtain. I leave it up for a little while and tell Papa not to shower with it up, while I decide what to do. I think about just keeping it, remembering the days when I’d shop for fun and buy things because they were cute and on sale. Many of my purchases would never get used ending up in a yard sale or donation pile. I peeked in the bathroom again, and decided to take it down, pack it up, and take it back. I had slipped away from my mission, although briefly and not completely, it happened. It happened because I am American. I was raised in a culture and time where we shop to fill voids. We find it exciting to bring home something new as if it will bring new life. For a moment this week, I fell back into the mindless pattern of walking into a store and buying a packaged product to fill a need. BUT-This time I caught myself. I saw how out-of-place it looked hanging there and realized that I forgot I could make do, that the white shower curtain could be washed, that I could paint it or make something I really like. I washed the white one and hung it back up. Tiny House deserves something beautiful and handmade, so I made a curtain to hang over the white one. It is perfect and adds beauty to our home. Stripping away the mindless matter—the stuff that doesn’t belong, has had a noticeable effect on my personality. I have become clear about what I want my space to feel like. Since it is so small, every single thing has to be just right. I see myself doing this in other areas of my life as well. If a situation doesn’t feel right, I turn away, create a boundary and find another way to feel good. I see with a clarity I haven’t seen before. There is a parallel in creating a simple, organized home to an inner simplicity, clarity and mindful way of being. 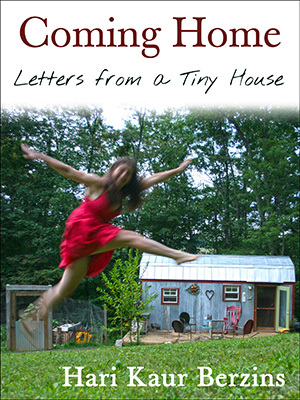 I highly recommend scaling down as a way to free you from the burden of mindless matter. What stories do you have to share about the relationship between stuff and happiness? Kudos you you, Mama, for catching yourself in the moment. C and I face that same dilemma every time we find a need (or perceived need) to purchase something. Just as we look to food labels for ingredients, we look for where and how the product is made, and, if made in China, we look for another option. But I have to admit there are times where we yield to the, “Oh let’s just get it. We can spend forever looking for something made locally.” It’s rare but it does happen. So I commend you on being mindful of the value in simplicity and making do with what’s at hand. Great post! Thanks, Ricardo! You and C are an inspiration. Much love. Like Ricardo, I too, am proud of your decision to take the unnecessary, polyester-blend curtain back to its rightful owner: Consumer America. This connection I have between stuff and happiness is a disease; I am not immune. When I drop something off at Goodwill, I am reminded that I am still suffering from this disease. Whenever, I ask myself the following questions… Why did I buy this? When did I buy this? What was it for? How much money did I spend on it? Did I need it, or did I want it?… I know that I continue with the symptoms. Over the last five years, I have become more aware of my consumption and more cognizant of the stuff I have. Slowly, I have built up my immune system to conquer this obsession with stuff and happiness. Living without a credit card (and the debt associated with it) was one of the first steps I took. It was one of the best decisions I ever made. Currently, I am considering my mode of transportation. What would life be like without a car? With only a bicycle? I live 3.4 miles away from my workplace; I live in a small town. The idea is feasible. Still, courage is required, and I am not sure I have it yet. I love knowing you are examining your consumption habits, too. Good for you on the debt-free living. If you can make it without a car, I say go for it! I lived without a car while I was in Germany and I loved it. Of course, public transportation was everywhere there. If you can combine public transportation with bicycling, you will be golden. You are in Florida right!? So weather (except rain) and hills shouldn’t be a problem. I have always seen you as very courageous. I think you have it. 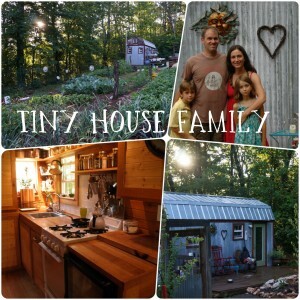 i was drawn to the tiny house blog because i’ve been wanting to live more deliberately, and via the site came your blog. yes! to be mindful within and without. to participate more fully. i divorced a lifestyle some years ago that came with the house on the golf course with the terraced yard with the pool (which, of course, came with a pool guy)…and now the less i have the more content i am. i am living more richly. last fall my b/f and i splurged and instead of our usual tent camping we rented a hunter’s shack that came with bucket for hauling water. we were so pleased with that bucket, a luxury. There is a lot of joy in simplicity, isn’t there? Ah yes! I know this experience well! You share this better than I have so I will share your page. Thank you for the well written words. You are welcome :). Thank you for reading them! You know that saying,”why by new, when used will do.” I try to live by that, rarely will I purchase anything new anymore. My daughters and I live in a small old mobile home. Our dilemma was storage. So I purchased old used picnic baskets, those with flat wood lids. We store many books and craft items in them, we stack them two or three baskets high. They look awesome, and can be used as end or side tables. I applaud your courage in examining your action and taking it back to the store. I bet your shower curtain looks lovely now. What struck me when I arrived in the USA (to live for two years) in 2001 was how many ‘things’ were available in the shops and that people actually bought them! I was amused and appalled that people bought duplicate stuff so they could change their decor and ‘accents’ to celebrate different seasons and holidays. And people bought so many items that were designed to be used just once and then thrown into landfill. I am so pleased to see that a growing number of Americans are becoming more mindful of the consequences to themselves and the world of this rampant consumerism. British people were never so extreme but we still use buying things to fill the void. I’ve noticed that in myself. Whenever I’m travelling on a journey I get the urge to buy something every time. I’ve discovered it’s because I feel insecure so use food and buying something to ‘stuff down’ that feeling. At some point you may try tea staining that old white shower curtain. 🙂 As for shopping and happiness. I don’t really feel all that bad when I shop. I think it’s mostly because I do most of my shopping for little things like a shower curtain at our local Salvation Army Thrift Store. I see it as I am helping myself,as well as helping others. To top it off I am recycling what was unwanted as well. Mercy, second-hand shopping is a joy! Thanks for your comment. It’s SO true. When you take the time to make something out of stuff you already have, like your fabric curtain, and/or even just take the time to clean or paint something, the end result is SO much more meaningful. It has an essence that is beautiful, regardless of how well it turned out. The process is artful and WAY more soul-filling than the temporary fix you get from finding a “great” bargain. But even so, it’s really easy to go the buy-something route–it takes thought and intention, a slowing down of pace, a creation of time and space for creativity and mess, when making something. We have to remind ourselves how much richer and more rewarding it is, though. And sometimes it takes an experience like yours to serve as the reminder, a taste of the cheesie-ness, that buying stuff feels great in the short-term, but is kind of a bottomless pit in the long-run. Tiny houses and vandwelling have lots in common (my 28th year). When i needed a curtain to separate the front and back, i chose a kingsize black cotton sheet, over a plastic curtain. Not only does the cloth kingsize flat sheet look better, but can be washed over and over, each time getting softer and more supple.